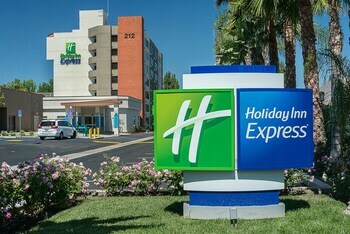 With a stay at Holiday Inn Express Fullerton - Anaheim in Fullerton, you'll be within a 10-minute drive of Knott's Berry Farm and Medieval Times. Featured amenities include a computer station, complimentary newspapers in the lobby, and an elevator (lift). Free self parking is available onsite. With a stay at this condo in Newport Beach (Balboa Peninsula), you'll be a 3-minute drive from Balboa Pier and 9 minutes from Newport Pier. With a stay at 201 Ruby by RedAwning in Newport Beach (Balboa Island), you'll be within a 15-minute drive of Orange County Museum of Art and Sherman Library and Garden. With a stay at this vacation home in Newport Beach (Balboa Peninsula), you'll be a 4-minute drive from Balboa Pier and 9 minutes from Newport Pier. Located in Anaheim (Anaheim Resort), Little Boy Blue Motel is within a 10-minute drive of Disneyland® and Disney California Adventure® Park. Free self parking is available onsite.